Modular cleanrooms allow for the use of convenient standalone cleanrooms that can be extended or relocated in a straightforward manner. As one of the leading designers, suppliers and installers of modular cleanrooms nationwide, Stodec Products are ideally placed to provide these contamination-free areas to all commercial and industrial customers. We can manage your cleanroom project from start to finish, carrying out an initial survey of your site to assess your needs before drawing up a detailed plan that will guide the final installation. 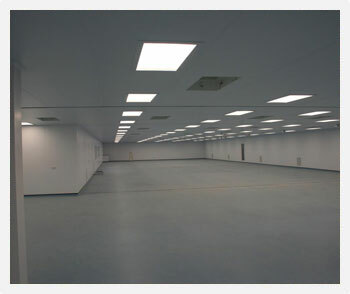 Stodec carry out this specialist work through our designated company, Clean Room Installation Services Ltd, supplying and fitting all plant, ductwork, walls, floors, ceilings, control systems, internal fittings and storage equipment. For more information, or to request free advice regarding your needs, get in touch today. The 50 x 15m Class 7 Main room extended to 900mƒ with change facilities, material transfer hatches and plant mezzanine.